Hey folks! This one is super overdue! Like extremely overdue! So let me first apologise for being so late with this post and explaining why it took me so long. I visited Bushmills in April this year. Yes, April! I had a problem! Actually, I had two problems!! First, when I got there my camera decided to die and so I went on to use Charlie’s phone to make the photos of the whole experience. And that worked quite well. The only problem is, upon return Home, I didn’t transfer them immediately and not long after Charles broke the phone. It took a lot of work to find someone who could help me save some of the images on that phone, and last week I got the happy news, and finally, I get to write about my trip to Ireland! So as I mentioned before, Charles and I took a short weekend trip to Ireland to visit the Giants Causeway! We took a flight from London and flew into Belfast, from which we got a rent a car and started our journey. Since we only had two days we immediately started checking things off our itinerary. Our first visit was the Dunluce castle, which was not so far from the Busmill. I hope you excuse the gloom in my photos, but the weather was not on our side, and it was very hard to catch good light in the rain. Dunluce castle, unfortunately, is not really a castle anymore. It has turned into ruins, but it is still interesting to see how it all looked back then. I was maybe 9 weeks pregnant then but I was sooo tired all the time it was hard to keep up. 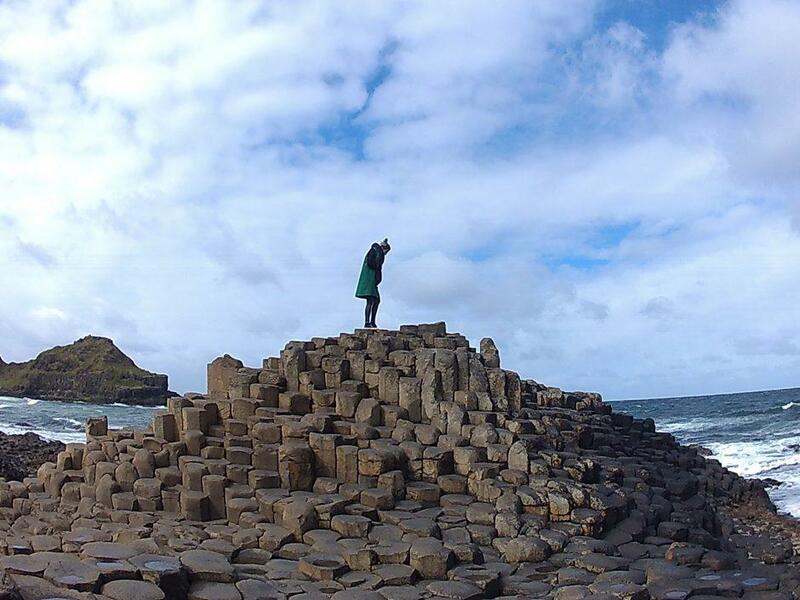 It was very windy in Giants Causeway that day, but we could not miss the opportunity to go and see it. Once you arrive to what seems to be a museum, you have two ways to get to the giant’s causeway. You can walk and have a walking audio tour, or you can take the bus. I opted for the bus, because it was so freaking cold, and I hate the wind. I was so impressed with everyone who decided to walk there, it was really cold and not for me. Once we got of the bus we had a nice sight. Giant’s causeway is a very unique place and if you are ever looking to make a unique photo of a great invention of mother nature, then this is the place to go. Ah for all of those whiskey lovers, this is a heaven on earth. While we stayed in the Bushmill, there was an opportunity to visit the distillery. No photos were allowed inside the distillery but nevertheless, it was a unique experience. I actually didn’t get to try the whiskey since I was in early pregnancy, but Charles took a wiff of all kinds and just went for it! Okay so this was totaly not what I expected. I saw pics of it online and it looked so much different. I guess it varies during th seasons. Here the trees were naked and they didn’t look so fantasy like, but I guess it’s okay to show a different perspective. i bet loads of people come here and look for a great angle to take a photo of, but this is what it is like in reality. Still cool, but not as cool as the google shows. I’m so sorry i can’t show you more. We were supposed to go and visit this epic rope bridge, but it was so windy they closed it. I guess that would have been a great adition to our trip. But never the less, I believe we have seen enough for the 2 days we spent here. In my next post read about where we stayed. It is really epic.